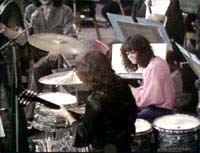 The new EMI DVD is the third video release of the 1969 Concert film. Sadly it doesn't contain any more footage than either of its predecessors, but it is certainly worth buying again. 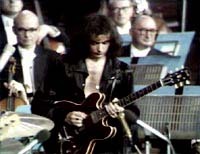 The Concerto was originally filmed by British Lion Films, and edited down to a 52 minute programme eventually broadcast by BBC2 in April 1970 as "The Best Of Both Worlds". This DVD is not taken from the 35mm film footage but is actually the edited television video master. Therefore it misses an orchestral chunk from the First Movement (just before Blackmore's guitar work out), and part of Paice's drum solo. The film masters (most probably complete) were unfortunately stored in colour separated reels, and as a consequence restoration was well beyond EMI's budget for the project. Still, let's look at what we have got.. Even though it's a little soft in places, the picture quality is actually very clear, a big improvement on the video tapes, though the format differences may account for a lot. What really hits you is the incredible sound quality, extremely sharp. For me it was like hearing and seeing the show for the first time, which is what I would want from any DVD of already familiar material. So rather than gathering snippets for a detailed review, I ended up just sitting back and becoming engrossed in the whole thing. Having attended the 1999 Concerto, the differences between the two nights are striking. 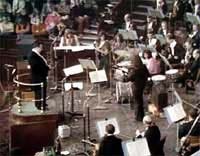 In 1969 the (mostly young) audience downstairs are standing, much as at Proms concerts, making for a very close atmosphere in the hall. The orchestra for the most part seem unimpressed by the view in front of them, both of the virtually unknown young band letting rip, and beyond them the tightly packed ranks of teenagers dancing to the rockier parts of the music. The band themselves all play extremely well, and it's interesting to see just how integrated the two newcomers from Episode Six are. 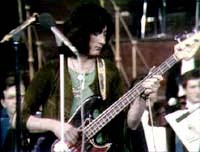 Personally I much prefer the band's contribution in the 1969 Concerto to the 1999 repeat, particularly the fabulous sound from Blackmore's Gibson. 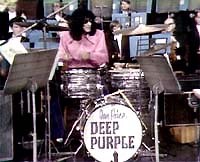 The supposedly duff performance of the orchestra has never bothered me, and still doesn't. As already mentioned, the DVD contains the full "Best of Both World" TV broadcast, including a fascinating opening three minute introduction. 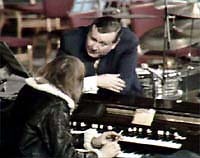 (Not listed in the package... more about that later..) After the opening titles (drunkenly letracetted at some wacky angles) this shows clips of the afternoon rehearsals; conductor Malcolm Arnold chatting with Jon Lord, and Deep Purple running through 'Child In Time'. If only more existed. 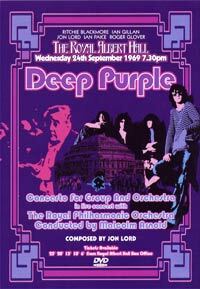 Sadly we don't get to see Deep Purple's 'More Shades..' Concerto support slot at all, it simply wasn't filmed. As for extras, we get an audio commentary by Jon Lord, recorded in 2001. It's an interesting listen. The photos are ok, though I still don't really see any use for them. Finally, the packaging. I quite like the acid mock poster cover, the front of the original programme reproduced for the internal leaflet, and the Harvest logo on the disc. Unfortunately attention to detail is lacking elsewhere, with Gillan's photo missing from said leaflet. Not good. Niggles apart, I know I'll be playing this DVD more than I ever played the videos and previous audio releases; it has never looked or sounded better. Q. Will I be able to play The Concerto DVD on my DVD player? A. Good question. The DVD has been issued as Region 0 (which is playable worldwide) but, so far, only in PAL. This basically means that if you live in an NTSC area (eg USA or Japan), you will not be able to play the DVD. An NTSC version will hopefully be released, we'll let you know in mk1-6 news if and when this happens.